Give yourself and your loved ones a delicious gift this year. There's no reason the holiday season has to interfere with your healthy lifestyle. 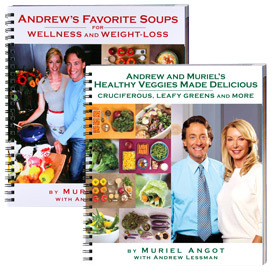 In keeping with Andrew's healthful outlook on life and wellness, Andrew and Muriel’s Happy, Healthy Holidays Cookbook offers a unique collection of natural, wholesome and festive recipes, all of which have special meaning to Andrew, himself. It's not often that I write a product review; in fact, it's even less often that I cook anything. 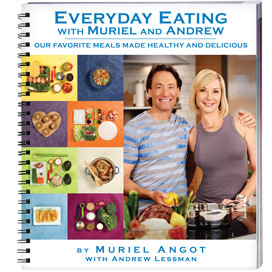 Nonetheless, this cookbook has really inspired me in the kitchen. 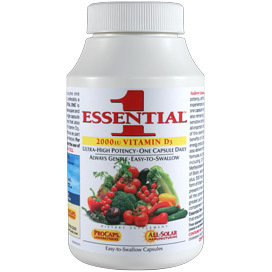 I appreciate the step-by-step photos and the detailed breakdown of nutritional information. 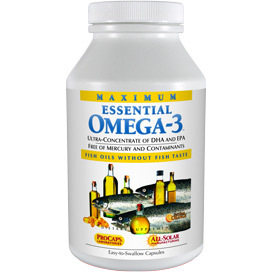 (And we're not just talking calories and fat, but all the vitamins and minerals in each dish -- even Omega 3.) I've made the sweet potato/zucchini latkes and the pumpkin soup so far, both of which turned out wonderfully. I cannot wait to tackle more of these recipes. This book is a winner! 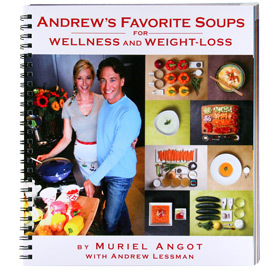 This cookbook is wonderful! I've already made Muriel's "Kale, Ricotta and Pumpkin Lasagna" and the "Quinoa Salad with Beets" and they both turned out great! 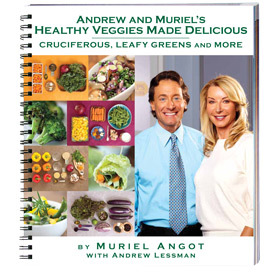 Aside from all its terrific recipes, I like the way this book is set-up, with EVERY recipe having 3 "sections" of gorgeous colored photos + an initial picture of all the ingredients, then photos of the recipe actually being prepared, and then a final picture of the completed recipe. And this book's spiral binding, and the thick/good quality paper it's printed on, is an added plus! 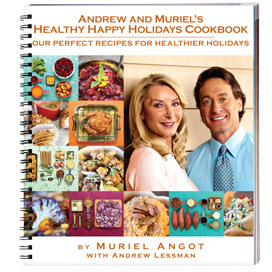 I'm very pleased with ANDREW AND MURIEL'S HEALTHY HOLIDAYS COOKBOOK, and I plan to make almost every recipe.